El apartamento se encuentra en la urbanización de Fuentebravía en el Puerto de Santa María, Cádiz. Situado en primera línea de playa, con vistas frontal al mar y acceso directo a la playa. Reformado recientemente es un moderno y exclusivo apartamento con un diseño que lo hace diferente a los apartamentos convencionales. Ideal para familia, amigos y parejas. Cuenta con una amplia terraza con vistas donde se disfrutar de unas maravillosas vistas al mar mientras cocina o descansa en el sofá. Personas responsables, extrovertidas, hablan inglés. Nos encanta viajar y conocer otras culturas, y hacer que los clientes disfrutes al máximo de su estancia en Costa Ballena. Te ofrecemos un servicio profesional y personal con el que podrás contar en todo momento. Te recibimos en en el apartamento situado en Calle Mora. Atendemos cualquier sugerencia, te asesoraremos sobre lugares que visitar o donde comer. Disponible las 24 horas del día para atenderle durante su estancia. 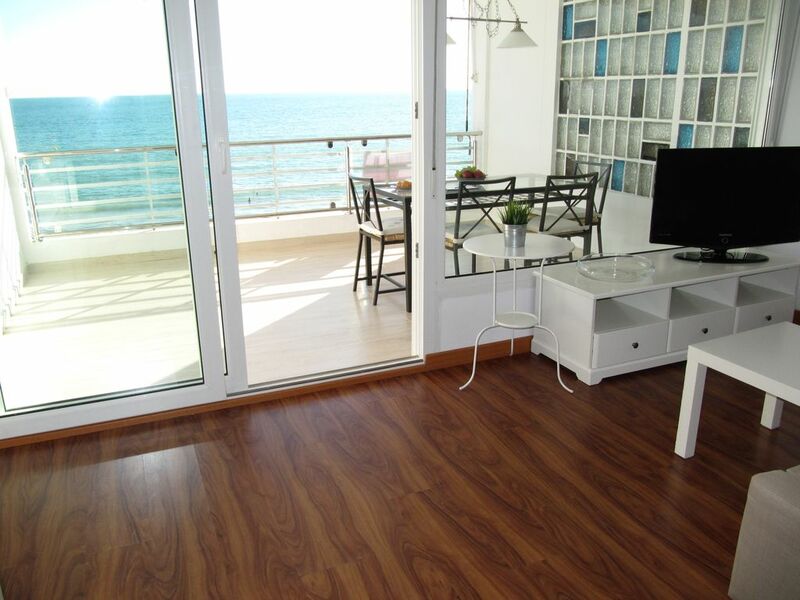 Apartamento situado a pie de playa y con todo lo necesario para descansar y desconectar con las maravillosas vistas del mar. Wir waren zu zweit (zwei Schlafzimmer leider nur mit Fenstern zum kleinen Innernhof) zehn Tage im September/Oktober in diesem Apartment bei Puerto de Santa Maria und haben uns gleich zuhause gefühlt. Carlos übergab uns die Schlüssel und erklärte uns alles sehr nett. Die Ausstattung ist gut, aber das Beste ist die Toplage direkt am langen Sandstrand. In einem Schrank befanden sich Strandstühle und Sonnenschirme, die wir häufig nutzten. Das Wetter war super, man konnte im Meer schwimmen. Durch den Keller gelangt man bequem direkt an den Strand. Der ist sehr sauber und wird täglich gepflegt, es gibt Strandbars und einen Boardwalk. Vor dem Haus gab es einen Stellplatz für unser Mietauto. Vom Apartment aus gelangt man schnell nach Puerto de Santa Maria (Osborne besucht) und von dort mit dem Katamaran für 2,75 Euro nach Cadiz. Grandiose Stadt. Wir waren auch in Jerez und Sevilla (ein Muss!). Alles in alllem ein toller Urlaub. Würde am liebsten gleich wieder hin. first of all, thanks so much for your review. We are happy to know that you had a good stay in our apartment. The place is perfect for relax and to forget all the problems. It is very close to other cities and surrounded by supermarkets, bars and restaurants. And of course, the beach. The weather of an English summer in February! Although the road approaching the apartment - and its exterior - don't inspire confidence, the apartment itself is lovely: there are perhaps a dozen or more apartments in the block, all are long and (fairly) narrow, with just the one main window as you see - but what a view! Immediately outside the balcony you see is over a mile of beach, twice-daily washed by the Atlantic, unlike the dirty Med. beaches. Flip-flops might be needed to walk to the sea (as you cannot exit from the front of the apartment) but perfect for children (a bag of children's sand toys was in one cupboard). It was a bit tricky finding the apartment as "5" is the number of the apartment block (not prominently displayed) and no picture on this site resembles the approach to the apartment. It had radiators but these were no on when we arrived so we had a chilly first day. A twenty-minute walk south along the beach takes you to a very nice beach hut cafe open even in February. We had a hire car which was vital, we felt, although the one-way narrow roads take a bit of getting used to. Small shops but no supermarket within close walking distance - Super Sol about 8 mins in car though. El Puerto centre about 15 mins in car; Cadiz a bit further. Very friendly greeting from LifeApartments representative. thanks so much for your review. We are happy to know that you had a good stay in our apartment. We would love to see you again over here. We thoroughly enjoyed our stay in this apartment with an unbeatable location. The apartment was clean and modern, but the terrace overlooked the ocean with beach front access just below. Within walking distance of several cafes, but mostly just a thoroughly enjoyable vacation spot for relaxing and enjoying the surf, the shells, the walks and the moon shining on the ocean at night. Superbe appartement bien aménagé et très propre. Literie très confortable. Très belle vue sur la mer avec une grande terrasse. Accueil très chaleureux de la part de Cristina. En el Puerto de Santa María, ciudad luminosa y abierta, realzada por la belleza de su centro declarado Conjunto Histórico, se sitúa en la desembocadura del Guadalete. Sus playas idóneas para las actividades náuticas, sus modernas instalaciones deportivas y la amplia oferta en locales de ocio y restauración, la convierten en destino turístico de primer orden. Con magníficas alternativas de restaurantes y bares de tapas. A tres km del campo de golf, estación del tren y bus y a unos 18 km del aeropuerto de Jerez de la Frontera.